STOCKTON, Calif. - The Stockton Ports mustered just three hits on Saturday night, but they proved to be enough in a thrilling win over the Visalia Rawhide at Banner Island Ballpark. The Ports, trailing 1-0 most of the night, got an eighth-inning home run from Greg Deichmann and a walk-off single in the 10th from Viosergy Rosa as they upended the Rawhide 2-1 in extra innings. Visalia's lone run of the contest came in the top of the first inning on a solo homer by Jazz Chisholm off Ports starter Kyle Friedrichs. It was the only run allowed by Friedrichs and one of just four hits he allowed over 6 1/3 innings. Friedrichs struck out five and walked two in his outing. Rawhide starter Connor Grey allowed just one hit over the course of his seven-inning outing. Grey gave up a leadoff single to Rosa in the second inning and then proceeded to strike out his next five batters in succession. Beginning with the first out in the fourth inning, Grey set down his final 12 batters to conclude his outing. He was rendered a no-decision after seven strong innings while walking one and striking out nine. Jason Creasy took over for Visalia in the eighth and gave up a one-out homer to Deichmann down the right field line that tied the game at 1-1. It was the only hit allowed by Creasy in his lone inning of work. Breckin Williams (0-1) took over for Visalia in the ninth and set the side down in order to pitch the game into extra innings. After 2 2/3 scoreless innings worked by Pat Krall, Angel Duno (5-4) took over in the 10th and pitched around the free runner at second base, getting a pop-fly and back-to-back strikeouts to end the inning. Williams came back out for the 10th and, with Chase Calabuig starting as the free runner at second base, saw Luke Persico reach on a sacrifice fielder's choice on which Williams threw to third late, putting runners at the corners with nobody out. Rosa came up next and laced a single off the glove of first baseman Pavin Smith to score Calabuig and give the Ports a 2-1 victory. The run was unearned for Williams, who suffered the loss in the contest. Duno picked up his fifth win of the season for Stockton. 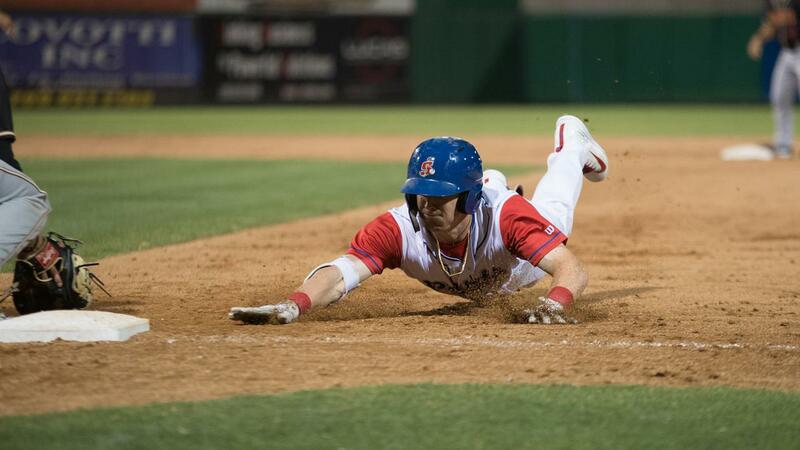 The Ports and Rawhide play the third game of their four-game set on Sunday night at Banner Island Ballpark. Xavier Altamirano (5-5, 6.08 ERA) makes the start for Stockton, opposed by Visalia right-hander Cole Stapler (0-7, 4.80 ERA). First pitch is set for 6:10 p.m. PDT.